Rapper Tyga's family approves of his underage girlfriend Kylie Jenner because they believe she comes from a better family than Blac Chyna. The family of loved up rapper Tyga has told of their relief that he has dumped model Blac Chyna to swoon 17-year-old Kylie Jenner. 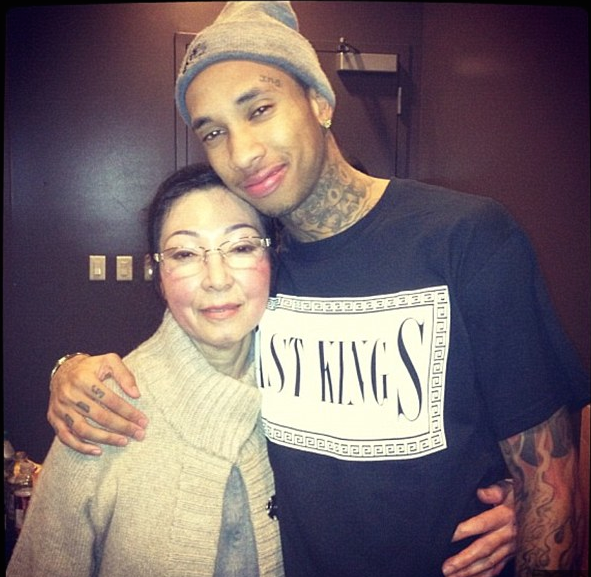 Giving the unlikely romance the family seal of approval, Tyga's grandmother told how despite him having a two-year-old son King with his ex, she couldn't be happier that her grandson has traded Blac in for a younger model. 'Yes she is King's mum, but Blac just wasn't a very nice person and Kylie comes from a much better family. 'She is such a sweet, lovely girl and seems to adore Tyga. Former stripper Blac and Tyga had been an item since 2011 when she appeared in his 'Rack City' music video. On October 16th 2012 their son King Cairo was born and in December of that year the curvy 26-year-old confirmed their engagement. Blac, 28, - real name Angela White - had once been one of Kylie's big sister Kim's best friends. But after rumors of her fiance's romance with Kylie began to swirl, their friendship soon soured. And this year a very public battle of words between the two girls erupted on social media. While Blac claimed Tyga – whose real name is Michael Ray Nguyen-Stevenson - had been texting her begging for a reconciliation, Kylie hit back and tweeted claiming Blac's texts from Tyga were fake. But family matriarch Kim settled the battle once and for all, when she told how her grandson had never been happier. Speaking from her modest apartment in a suburb of LA, Kim, who is Vietnamese and the mother of Tyga's mum Pasionaye, said: 'Tyga adores Kylie and has introduced us to her lots of times. 'She loves Vietnamese food, so we love to cook it for her whenever Tyga invites us to his home. Kim tells how despite his humble upbringings in an impoverished part of Los Angeles, none of the family were surprised at his rise to fame. She said: 'When he was little I used to slap him and say 'Stop singing and get to school'. 'But he wouldn't listen and now it looks like we were wrong and he was right. Ask his grandma whether the fact her grandson is dating a girl so young bothers her and Kim laughs and says: 'No, Tyga is only a baby himself, so we don't see what the problem is. His mom looks great for 70...that's all I got. No this is how AMERICAN Asians are. Are they serious about this bullsh*t? Just as dysfunctional as Black Americans. well educated? Kardashians? I know very little of them, by choice, but I have never read they were educated. What did I miss? Wasn't she 16 when they hooked up? They co-sign pedophilia?! Since when was he "impoverished"? His parents had money and he's always been a a clown. He's not from the streets. I forgot which TV show he was on some years ago, but he was on there bragging about how much money his family has.